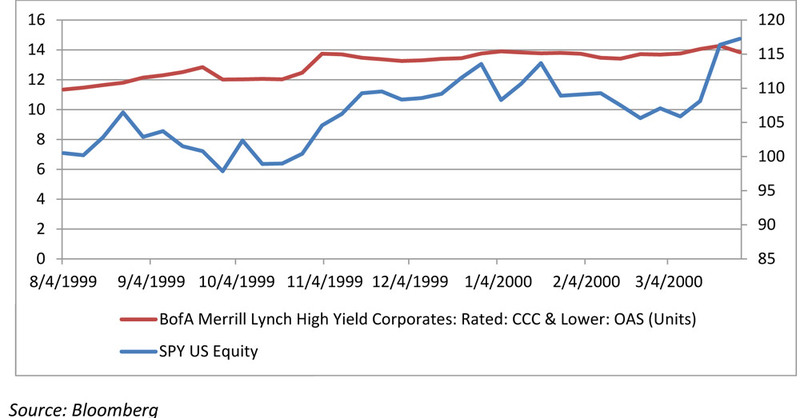 High Yield: Are ‘Fixed Income People’ Smarter Than ‘Equity People’? What are junk spreads telling us about equity risk? In late August I wrote about the implications of corporate credit spread increases that we have seen in 2015. I warned readers that increases in junk credit spreads have historically been predictive of the stock market moves, especially after a prolonged period of very low spreads. There is a basic explanation for why that happens. Junk spread is the weighted average spread of CCC or lower rated companies over the comparable Treasury security. As such, it is a pure expression of how much risk people are willing to take, how much they need to be paid for that risk. As you can see from the chart below (S&P 500 on the right y-axis; CCC or Lower spread on the left), since 2012 investors really wanted to play on the wild side – the spreads (red series) have reached historically low levels not seen since 2007. So what? Well, as Hyman Minsky pointed out in a brilliant Financial Instability Hypothesis paper – the investors that take too much risk will eventually reach a Minsky Moment. The leverage built up in the system will start to unwind, producing deflationary force. Junk spread has historically been the canary in the coal mine. Consider a period before the 2000 dot-com bust. The spreads started rising in August 1999, while the oblivious equity market kept going up all the way through April 2000. We all know what happened then. What about before the 2008 crash? Surely, investors have learned that lesson. Well, no they didn’t. Since at RiXtrema we work with both, I can’t possibly support that explanation for why junk spreads work as a signal. Whatever makes you remember to pay attention to corporate credit spreads is worth it, even an insult. Since September 29th, the S&P 500 has bounced back from 1884 to 2013, a bounce of almost 7%. Are we done with selling? Not if the ‘fixed income people’ have their say. 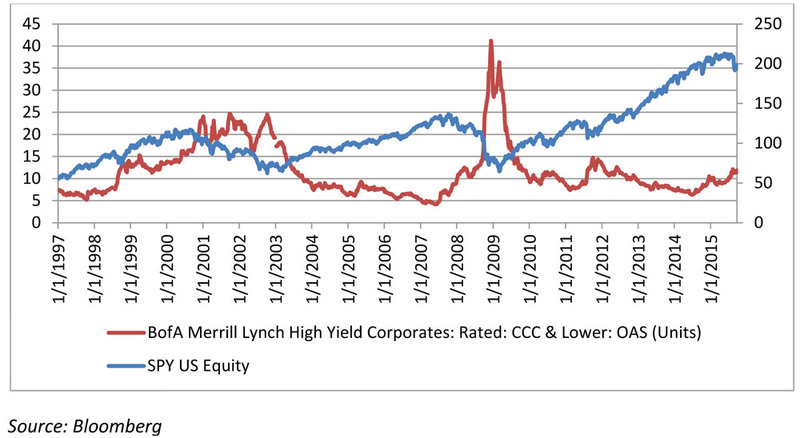 The Merrill Lynch CCC or lower index spread has not budged. It went from 12.7% on 9/29 to… exactly the same level i.e. 12.7% on 10/7. You can check OAS for Merrill Lynch indices here (need to open a free account). If spreads do not tighten soon, then this bounce will not last. But isn’t high yield index mostly about energy? Energy, after all, is the highest weight in that index. Here is Merrill Lynch’s own response to this argument, from 9/29: “Point out the troubles in Retail and Semiconductors and pat comes the reply that one’s always been structurally weak and the other’s going through a secular decline. Mention the stirring in Telecom and we’re told that it’s isolated to the Wirelines. When we began writing this piece, Chemicals and Media were fine, and Healthcare was a safer option; not so much anymore.” Here is a detailed summary of the UBS and Merrill reports on the state of the high yield market. We have seen above that junk spreads rising from low levels are a good indicator of serious turbulence in the financial markets. But is it only about spread levels? Consider the chart of corporate debt issuance in $ billions starting in 2005. Anything stand out? High yield credit issuance has actually been falling for three years now (for 2015 we simply assumed that the remaining months of the year will repeat 2014). Interestingly, it was also falling in 2006 and 2007. 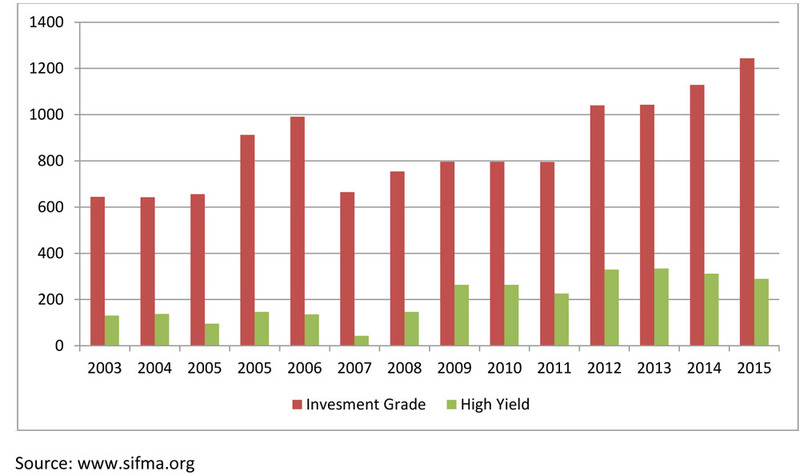 What is even more interesting is the growth of investment grade debt issuance over the past hree years. It started at historically high levels in 2012, continued with an 8% rise in 2014, and a projected 10.1% rise in 2015. If you were perplexed about how exactly the Fed’s zero interest rate funding actually gets into the markets, here is a big part of your answer. Corporations issued a great deal of debt and bought back stocks at a historic pace. So if this rate of investment grade issues slows and market volatility keeps increasing, watch out. Caution on high yield debt. Become a ‘fixed income person’. Every advisor must understand financial markets. Today it is just as important to understand and watch the dynamics of high yield bonds and investment grade bonds, as it is to know where the Dow closed today. Your expertise will pay off when you are discussing risk with clients and they will be able to make informed decisions. Understand the exposure that your clients might have to corporate debt in various funds. Investment grade exposures can be quite varied and there is a big difference between AA and BBB. If you find that your clients hold a lot of BBB debt, do not consider it a safe haven like treasury or AA debt.